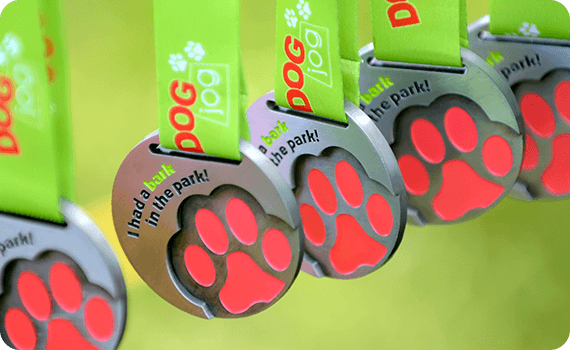 Taking place in Glasgow’s beautiful Bellahouston Park, The Dog Jog series are unique 5k jogging events for you and your dog to get fit and have fun. Each event offers a relaxed and fun atmosphere with no times and no pressure. They are also a great opportunity to meet like-minded dog owners. The event winds around the expansive parkland and takes advantage of the asphalt path throughout. The route climbs in the middle with the runner rewarded with views over Glasgow. At other times the course passes by the mixed parkland and ornamental gardens that have been a highlight of Glasgow’s Premier Public Park for over 100 years. The start/finish area is located with the cycle track of Bellahouston Park which is located on the south/west side of the Park. This extensive park covers an area of 71 hectares (180 acres). It has many features and facilities to tempt visitors and local residents to its grounds. It boasts formal gardens and open parkland in which to relax and take in views over the city and beyond. The Dog Jog Glasgow route remains on a tarmac path throughout and is suitable for wheelchair users. There is a hill that could prove difficult and therefore wheelchair users may require assistance to climb and descend. The hill takes in around 1km of the course (climb & descend).